Buy this item and earn 49 Kredits! Each 100 Kredits collected, you get a € 1.00 discount on your next order! Second print (500 copies) on now defunct KAOTOXIN Records coming as a full crystal / jewel box CD with full-color 12 pages booklet. Includes free digital download version of the album. It took the Chaigne brothers ten long years but here it is: the debut SAVAGE ANNIHILATION full-length is there! Obsessed with zombies, cannibals and everything blasphemy, the French sung album, “Cannibalisme, hérésie et autres sauvageries” stinks the stench of decomposition and rotten bowels found in sewers, somewhere between MORBID ANGEL’s “Altars of Madness” when it comes to riffing / solo-ing and KRISIUN’s “Black Force Domain” for the relentless brutality. 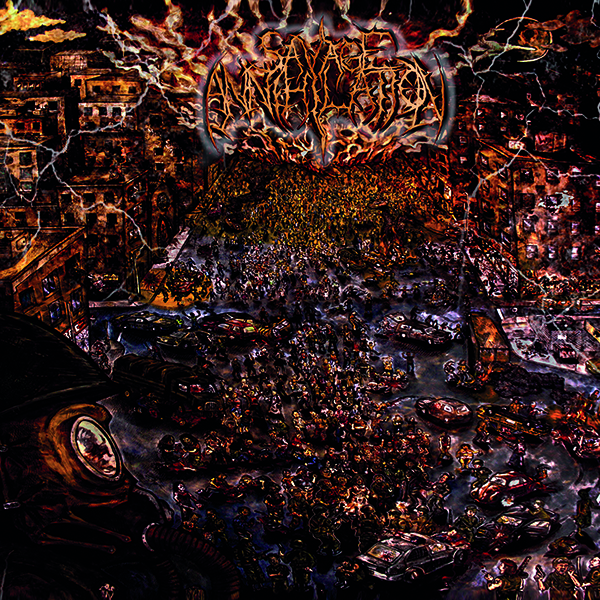 True Death Metal from the nauseating innards of the scene that will definitely delights gourmet fans of the afore-mentioned artists of the dead flesh and the likes of NATRON, NEFAS, REBAELLIUN, LOST SOUL, etc.